Tonight and tomorrow, the 22nd of Elul, is the yahrzeit of the Heiliger Pele Yoeitz, Rebbe Mordechai Dov Ber of Hornesteipel. A direct descendant of the Rebbe Reb Zusia of Anipoli, he was also the grandson and successor of the Cherkassy Rebbe, a son-in-law of Rebbe Chaim of Sanz, and a tremendous Talmid Chacham [Torah scholar] and Chassidic Rebbe in his own right. Rebbe Mordechai Dov was descended from many Chassidic greats [besides the Rebbe Reb Zusia]. These included the Baal Shem Tov, Rebbe Nachum of Chernobyl, Rebbe Schneur Zalman of Liadi [Chabad-Lubavitch], and Rebbe Aharon HaGadol of Karlin. But he was not one to rest on his laurels: he left us some great Halachic works, Emek Shaila [responsa], Turei Zahav on the Halachos of Ribis [interest]. He also expounded Chassidic teachings on Torah which are found in the Pele Yoeitz, for which he is known; Emek Chochma [which appears together with his grandfather's (Rebbe Yaakov Yisrael of Cherkasse) sefer, Emek Tefilla as Shoshanas HaAmakim. Finally, Rebbe Mordechai Dov is the forefather of the Hornesteipel Rebbes, and the first one [in his line] to take on the Twerski name, which was his mother's maiden name. His successors were Rebbe Yehuda Leib of Hornesteipel-Chicago; Rebbe Yaakov Yisrael, the Milwaukee Rebbe, who was the father of the famous Twerski brothers including Rebbe Shloime ZTUK"L, [who became the Hornesteipel Rebbe, and lived in Denver], R. Michel Shlita of Milwaukee, and R. Avraham Yehoshua of Pittsburgh. Both R. Michel and the present-day Hornesteipel Rebbe, Rebbe Mordechai Dov Ber of Flatbush, and tremendous composers and singers of Negina as well as their other Chassidic talents. And, oh yes, a wonderful book of the Hornesteipler has been written by his great-grandson, Rabbi Avraham J. Twerski, called: The Zeide Reb Motele. One of my favorite Pele Yoeitz stories is presented below, I hope you enjoy it, and your feedback is always welcome! Young Mordechai Dov seems to have been fascinated with mikvaot. Already thoroughly learned in the entire Talmud, at the tender age of eighteen he wrote his first sefer, "Chibur LeTahara" ["Connection / Author's Work of Purity"] on the Laws of Mikvaot and Netilat Yadayim, ritual immersion and washing of the hands. Even earlier, on the evening of his wedding [at age 15! 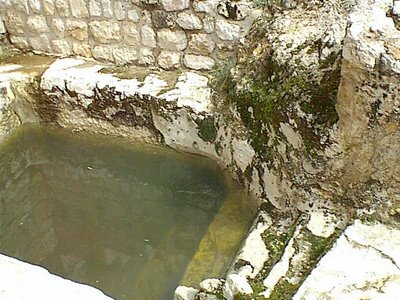 ], the Mechutanim, Rebbe Chaim of Sanz and Rebbe Yaakov Yisrael of Cherkasse, accompanied young Mordechai Dov to the mikva to watch him tovel [immerse in the water], remarking, "A tevila like this we've never seen!" However, the following event happened even earlier, but first we need an introduction, from R. Avraham Twerski [a descendant of the Hornesteipel Rebbe]. The Rebbe replied, 'A person's sincere wish is never denied, but that wish must be the person's foremost desire, and very few people pray for what is truly their foremost desire. "Take, for example, the person who prays for success and wealth. He may indeed be impoverished and may very profoundly desire to become wealthy. Yet, if he were drowning and could not catch his breath, he would, of course, not think of acquiring wealth. At that point, his most fervent and only desire would be to breathe and remain alive; hence wealth is not really his first priority. The Talmud states that if a person forgoes his own needs to pray for the needs of another, that prayer is warmly received." "The devotion of a tzaddik to his followers is so great," the Rebbe continued, "that their well-being becomes his first priority. The love of the tzaddik for his fellow Jew surpasses the love and devotion of a father for his favorite child. When a tzaddik prays for someone's health and success, his desire for that person's happiness is so intense, that even if the tzaddik were drowning at that point, his prayer would not be for his own survival, nor his wish to be able to breathe and remain alive, but rather that the other person's needs be fulfilled. This self-negation and self-sacrifice which the tzaddik achieves out of love for his fellow man is the reason why his prayers are answered." Rav Twerski continues, "The Rebbe knew of what he spoke." 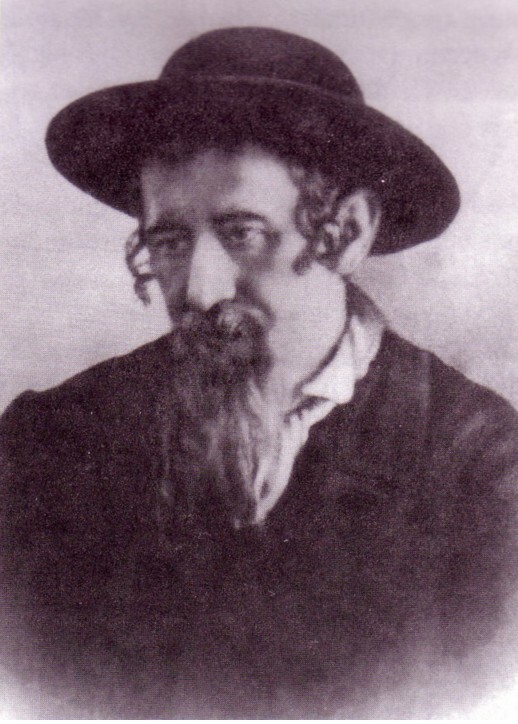 Mordechai Dov was orphaned at an early age, and was brought up in his maternal grandparents' house - that of Rebbe Yaakov Yisrael of Cherkasse, and Rebbetzin Devora Leah, daughter of the Mitteler Rebbe. Once, one of the Rebbe's [of Cherkasse] Chassidim came to him, to beg him to pray for his salvation. He had not earned enough to meet the payments on the inn and dwelling which he was renting from the "poritz" [feudal lord], and the latter began to take action against him. He had already removed the glass from the windows of his house, and the cold and snow were penetrating inside. He also threatened him with expulsion and imprisonment if his arrears were not promptly resolved. He could not envision any source of help, and came to Cherkasse to ask the Rebbe to pray for Divine mercy, so that he and his family would not languish in prison. To his horror, he found that the Rebbe was out of town. He therefore went to the Rebbetzin, who was known for her wisdom and righteousness, to pour out his heart and tell her of his bitter plight. Her advice was, "Go to the beit medrash [house of study] and find our grandson, Mordechai Dov. He should be able to help you." "But your grandson is only a child of ten," the man said. "I need the Rebbe. Our very lives are in jeopardy." "The Rebbe is not available now," the Rebbetzin repeated. Go talk to my grandson." The man found Mordechai Dov in the beit medrash, engrossed in his Talmud studies, and against his better judgment, unburdened himself to the young boy. The young boy listened sympathetically to the man's tearful tale of woe, sighed deeply, and said, "If only Zeide [Grandfather] were here, I am certain that he could help you. But there is nothing I can do for you." In desperation, the man cried out, "Look, your grandmother sent me to you. Now if you truly cannot help me, then I hold no grudge against you. But if you have the capacity to help me and refrain from doing so, then I shall never forgive you for what will befall my family - not in this world, nor in the Eternal World to Come." He then burst into bitter tears. The young boy was shaken. Before him stood an unfortunate Jew, whose whole life was in his hands. He suddenly felt the intensity of this man's pain and troubles. "Don't cry," he said in a soft, reassuring voice. "Let's light a lamp and go to the mikva." It was after midnight. The man accompanied the young boy to the mikva and stood by, holding the lamp, as the latter immersed himself beneath the surface of the water. After a few moments, the man became concerned that the child was not coming out of the water. As the moments passed, far beyond what seemed to be the human endurance for surviving without air, the man became panic stricken. He began to worry that because of him, something terrible had happened to the Rebbe's grandson. He tried to go down to the mikva to extricate the child, but his limbs seemed to be paralyzed - as if someone was holding him back. He soon forgot his troubles, about his being in arrears, and about his imminent eviction or imprisonment. He was totally occupied with the child, whose head remained immersed beneath the water. "Dear G-d," he began to pray, "just let me see that young child emerge from the mikva alive." After what seemed to be many eternities, the young boy emerged form the water. "Go home," he said. "You have nothing to worry about." Relieved, the man returned home, arriving in the morning. Several weeks later, the Chassid returned to the Cherkasse Rebbe and told him that upon his return home, the poritz had sent for him and apologized for having been so harsh with him. That previous night, the poritz related, he developed a choking sensation and was unable to breathe. In his panic he began to reflect that perhaps he was being punished by G-d for being so ruthless with his tenants. He then resolved that henceforth, he would be more lenient with them, and soon thereafter his breathing returned to normal. He then had the window glass restored to the Chassid's house, and said, "So I will not only forgive you your arrears, but I will also arrange more liberal terms for your future payments." Hearing this story, the Cherkasse shook his head and said, "This is too tender an age for my grandson to place his life in jeopardy." But the pattern that was initiated at the age of ten persisted for the next 53 years. The wants and needs of others took priority - always. It was around on tape but I dont have it anymore. Where do you find all of these stories that you post? They are all great stories that share a wealth of information. Have a great Shabbos. Anon 1 - Don't know about the Pittsburgher Selichos, sorry! Batya - thanks for stopping by & commenting, your feedback is always appreciated! Anon 2 - I didn't forget him, I've even blogged about him earlier, I just mentioned some of the brothers [the more musical ones]. There was also another brother who was niftar, R. Mordechai Dov. FWQ - I have an extensive sefarim collection, and also read a lot of stories, especially from Ascent of Safed. Ascent has stories that are non Lubavich? If so, are they in English and by which publishing company? I have many seforim with stories in them as well but I have never come upon any of them which you have cited. I also hear many stories from Alter Hassidim who witnessed some of these stories themselves. Its hard for me since I don't speak Yissish and my Hebrew is not so good to hear more stories and Divrei Torah. FWQ - Check out Ascent's website, where you can find loads of stories in English. I don't know if they have any books out. But yes, many of the stories are about other Chassidus besides Lubavitch. [Their URL is found in my post about the Zlatchover].